In my previous post I talked about the big changes behind-the-scenes as well as a few Carranger oddities. Be sure to check it out here. Or...if you don't care about that sort of thing and just want to get to the characters, shall we? 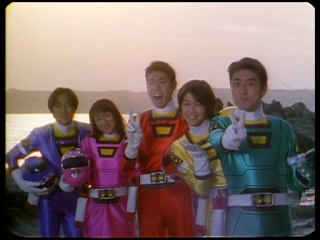 So let's look at the Carranger side, shall we? 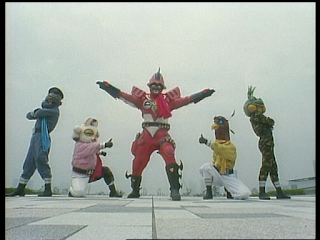 Carranger is made up of the five unremarkable citizens who work at Jidosha Kaisha Pegasus. They started working at the company in hopes of one day building their dream vehicles, but have largely fallen into the normal grind of repairing customer vehicles. They each seem to want to build their own dream car based on personal preferences. However, the vehicles that they have designed happen to resemble the constellations in which Kurumagic is based. 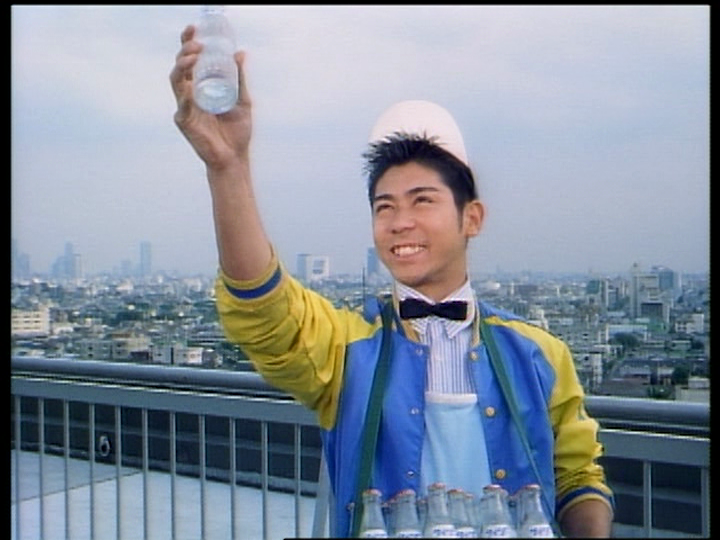 Of all of the Carrangers, Kyosuke had quite the experience during the series. First off, his cowboy stance walk and posture has to be one of my favorite things about him. I can't tell if the walk was a conscious decision, or one that came from wearing tight leather pants. Heh. Kyosuke's over-the-top physical demeanor is something of a rare thing among Sentai characters. Maybe we didn't learn a whole lot about Kyosuke during the series, but I'm almost certain that nothing from his past really matters. As a test driver, I imagine he's just a passionate dude who lives for the moment. Whenever his leadership comes into question, he tends to handily prove his worth. He was kinda lazy at first, but it didn't take too much for him to take his role seriously. Yuji Kishi just sold the hell out of Kyosuke. Even little things like his whimpering after Signalman beat him up upon returning. He gave such a detailed performance. Everyone in the cast really did, but Kyosuke had to have been especially challenging given the wide range between physical humor and being the suave leader. The 90s was loaded with great Reds, but Kyosuke really shines a little brighter thanks to Kishi's effort. Poor guy thought his friends hated him. Naoki is such a sweetheart that it's really hard not to like the guy. The story was that his friends shut him out of Pegasus seemingly for no reason. He kind of assumed it was because he had a secret job interview with a major auto manufacturer who was interested in his car designs. In his mind, his friends found out and labeled him a traitor. Well...nah, they just were planning a Birthday (for lack of a better term) party for him, but were off by a month. Heh. I'd be just as confused by the sudden shut-out. Outside of this...Naoki didn't really have too much going on. He made dentures for an alien he befriended... Ummm...he mistakenly joined a bike gang...he was afraid of a girl... He really didn't have too much else, did he? Naoki is just a nice dude. I think Minoru is hilarious. 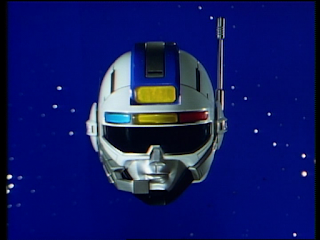 Upon getting the VRV Machines, the Carrangers were pretty confused. Minoru said it best though--"A Dump Truck...why...?". Heh. Minoru is such a likable dude. Given that he is the company sales representative, this should really come as no surprise. We got a few really fun episodes out of him too. 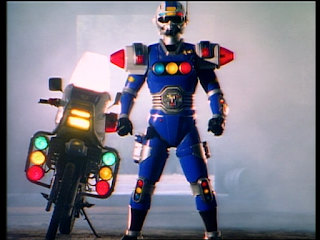 After completely obliterating a Gorotsuki in a street race, he was more concerned with practicing cool poses rather than maybe alerting his friends or getting back to work. In doing so he lost his damn Accel Brace. He didn't even realize it until he tried to use the Accel Key in thin air. Whoops. He was also pretty quick on his feet when he came up with the Scramble Intersection Robo. Nobody...nobody mugs better than this guy. I'm normally not a fan of mugging since it's usually done incorrectly. 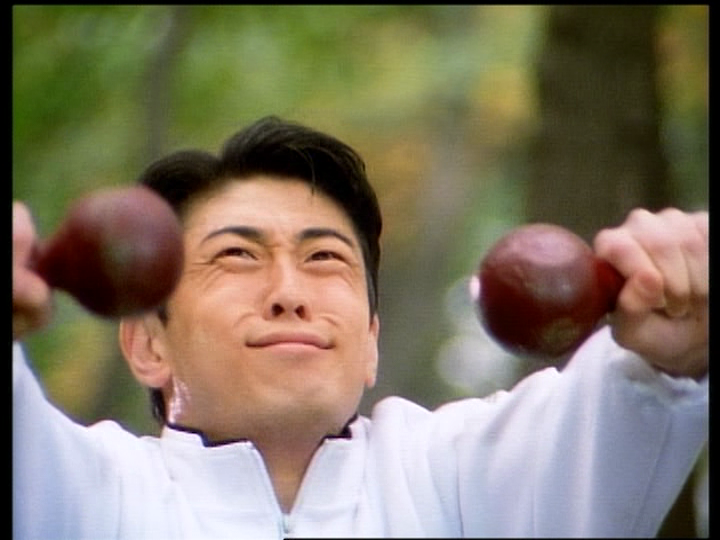 Minoru is hilarious, though. 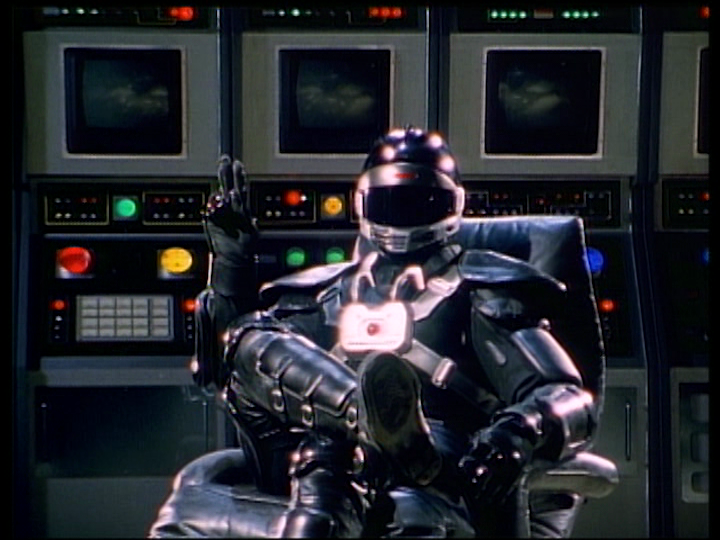 I mentioned in the previous post that I stormed through over 40 episodes of this series in about a day and a half. Big deal, right? Well, whenever I watch a show I take lots of screencaps. 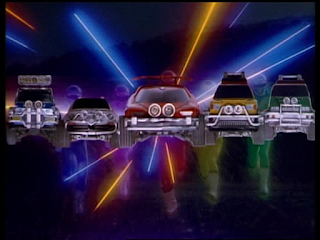 In this viewing of Carranger I took over 800 of them. 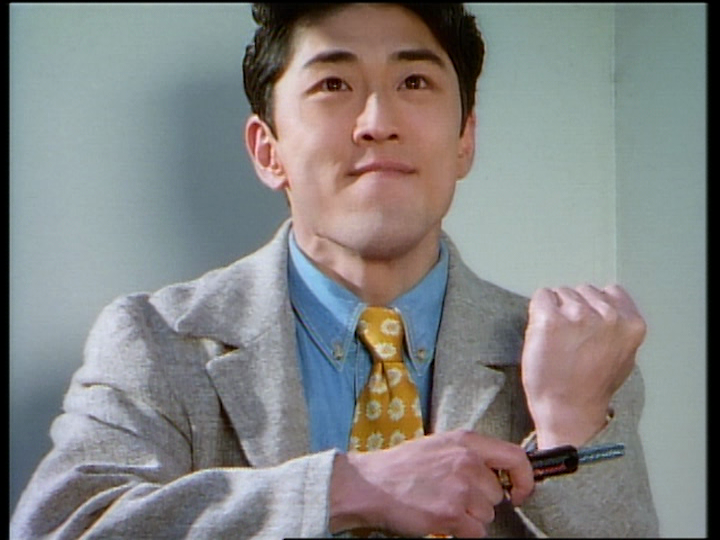 I could probably do a subfolder of just Minoru mugging. 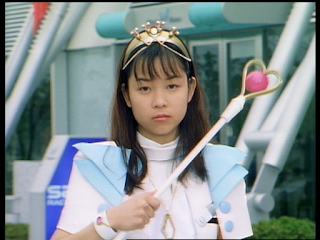 Natsumi is one of those characters that kinda stealthily makes her way through the series. I really like her consistency throughout the series. She was probably the most normal character in the series come to think of it. Her job as the garage mechanic probably lent a lot to her reliability. I've always been a fan of Natsumi. Her skills saved the day on quite a few occasions whether it being able to make repairs on Dragon Cruiser or creating the Car Navics with Yoko. I'm sure I've said it before, but I'll say it again. She's probably my favorite yellow. It's an unenviable color to end up with in a Sentai series since yellow almost never seem to get good stories/development. Natsumi made out better than most, IMO. 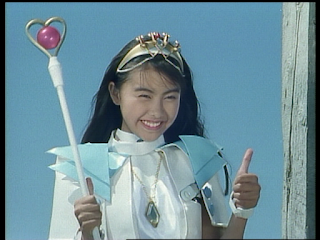 At the very minimum, she wasn't completely interchangeable with Yoko like the Ohranger gals were. The only difference between Juri and Momo was that Momo had more focus episodes. I always thought Yoko was the weakest character of the Carranger team. While everyone else had their own story to tell (Kyosuke really didn't either, but he more than made up for it in other ways), Yoko was just kinda a girl with boring problems. Her focus episodes include... "I'm overweight" "I'm terrible at directions" "I'm probably quitting soon because my horoscope said I'll be meeting my future husband today". There really isn't a whole lot to Yoko. While she really didn't have much to add as an individual character, I thought she was a great part of the team. She just wasn't all that interesting on her own outside of working with Natsumi on creating the Car Navics. How can one character be both creepy and utterly adorable at the same time? Dapp is one of those characters who gets the ball rolling and really doesn't do a whole hell of a lot after that. Like I was saying about the alien characters in the previous post, he only vaguely hides his identity. He seems to interact with people during the course of the series (giving Kyosuke food that he obviously went out and bought). People were pretty curious about him when he was being lured into the "Hazard Meet-up" trap. I like Dapp, but there really isn't much to him beyond fleeing his planet and giving the Carrangers their powers. He dispatches mecha and kinda hangs around as their friend for the rest of the series. Poor little guy. The series brat. You know, he was actually alright. When he wasn't managing to randomly get involved with the plot, he hung out with Signalman a bunch. As we later found out, he was kinda filling a void for Signalman as he missed his real son on the Police Planet. 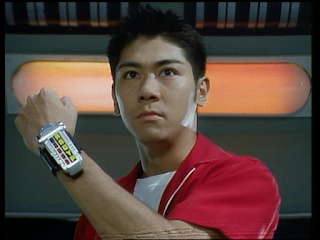 He was also a pretty big fan of Carranger and one of the first people to find out that were the schlubs from his dad's shop. Ichitaro's father and the owner of Pegasus (the name kinda says it all). Given how rare his appearances are, I have to imagine that Pegasus is more of hobby to him than his actual job. He probably has like two or three money-making ventures...and Pegasus. I thought he was a pretty funny character, but we didn't get a whole lot of him. He seemed a bit stricter earlier on, but seemed like an alright enough boss. He took them all on a company trip for the obligatory Summer vacation episodes. It sure was nice of him! An alien police officer from Police Planet who happens to be stationed on Erf during Bowzock's attempted destruction of it. Signalman operates out of the Kobaan Base, which is always located in zero-traffic areas. He quickly aligns himself with Carranger, but has the tendency to put traffic laws first over, you know, impending invasion. 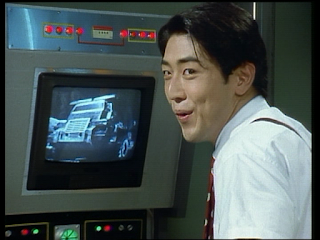 This leads to him occasionally having it out with Carranger. 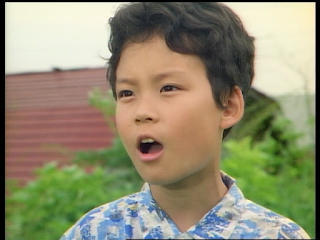 He befriends Ichitaro, but grows to miss his own son in the process. Signalman is the outside help done right. I really had a problem with how much of a heel Gunmajin was in Ohranger. 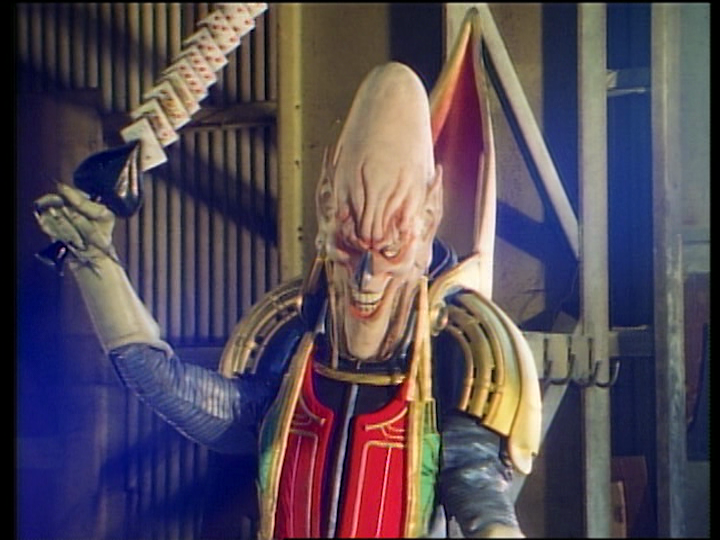 Signalman isn't *that* different from Gunmajin in that they both can complicate things further for the rest of the team. 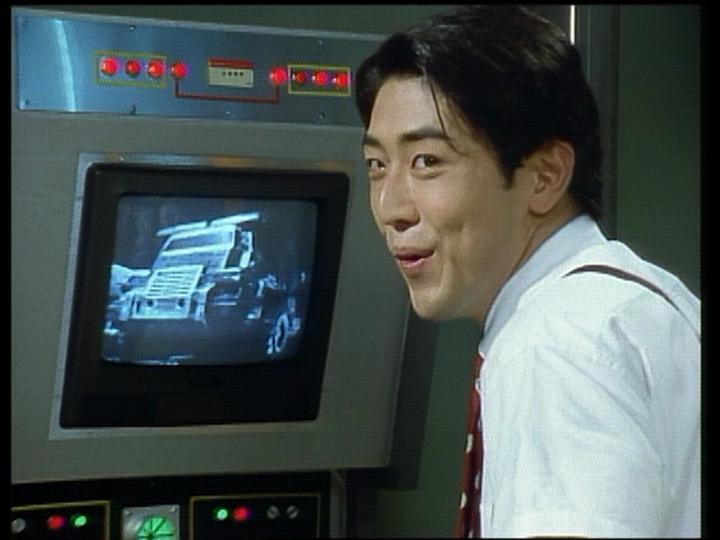 Signalman just happens to be in the right series. Also, he was introduced way earlier on (episode 12), which at least gave us plenty of time to enjoy his presence and give him proper story. Gunmajin showing up in the mid 30s of a series that only ran for 48 episodes was almost a complete waste of time since he ground all of the late-series momentum to almost a dead halt some of the time. 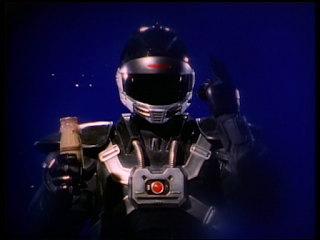 Who cares if Signalman is wasting time in episode 15 (random number)? When Gunmajin is shitting up everyone's day in the 40s, it's a pacing nightmare. A fun concept pushed too far. 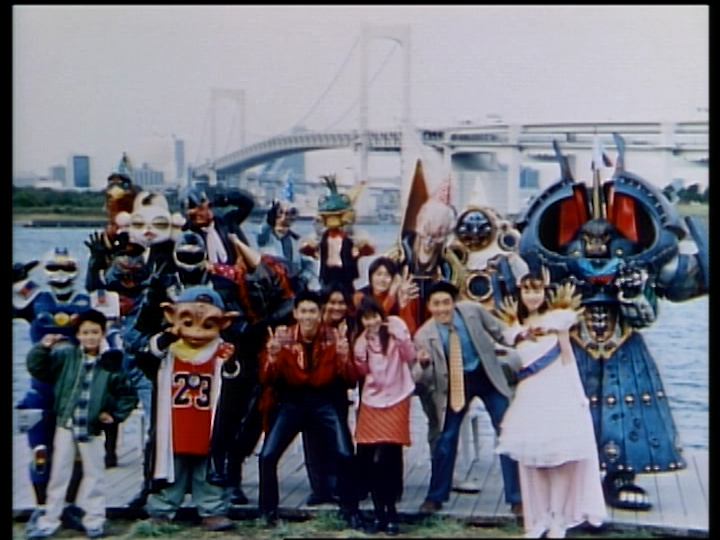 When Signalman abruptly admits that he misses his family and decides to take leave to be able to join his son Sigtaro's field day, it shows flashes of his nightmare fuel odd looking family. That would have been enough...and maybe better suited for the finale. Then it kinda became this whole plot about the Ranger Vehicles and polution blah blah and then suddenly Sigue and Sigtaro are on Earth just hanging out with Signalman. Why? If it was so damn easy for them to join him on assignment now, why not sooner? Meh. I kinda wish his family were only a brief gag rather than actual characters. Dapp's Father in disguise. Yeah, maybe you should watch the damn series... VRV Master really is Dapp+Signalman, both of which were out of commission (Dapp in hibernation, Signalman at his stupid field day with his son on Police Planet). He had a slick suit and spoke in such a serious tone...but almost everything he said and did was really strange since he was obviously more hip to Hazardian tradition than Dapp was. I really liked the sudden turn the series was taking when VRV Master showed up. 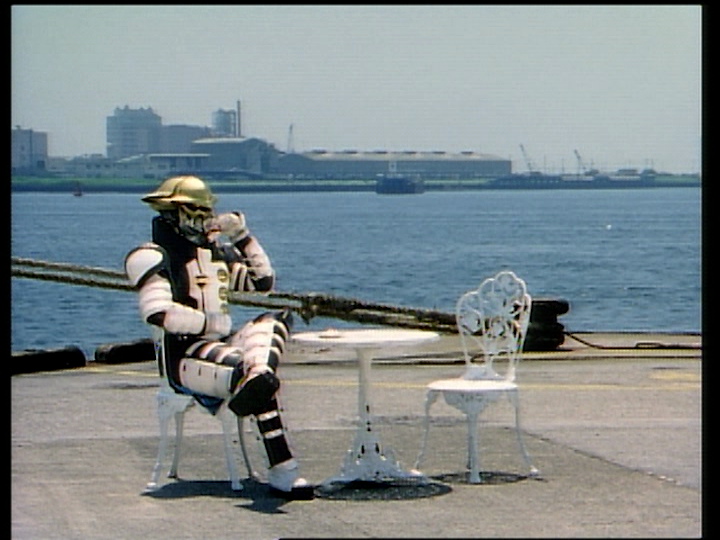 Carranger really wasn't having too much of a problem, but were suddenly without their friends and RV Robo had been stolen. A mysterious dark figure approached them and gave them baffling new mecha only to shortly leave again because the sunrise was too bright on Erf. It was pretty funny when Dapp woke up and suddenly his friends had somehow gotten their hands on mecha probably meant for GoGo Five. 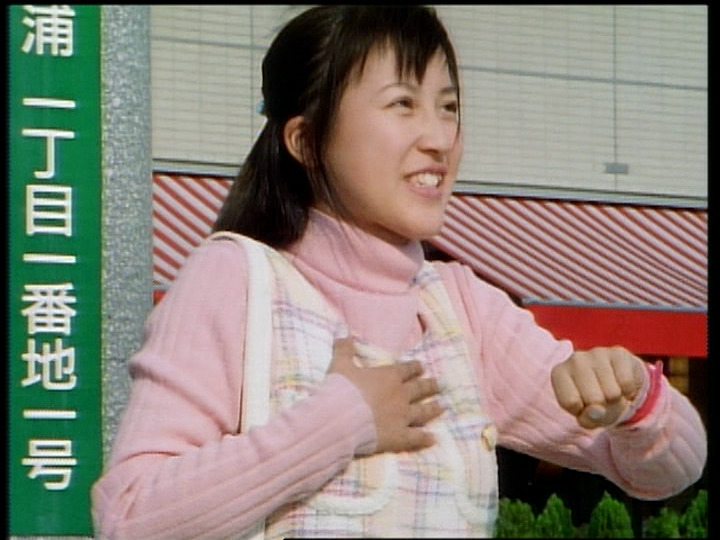 A mysterious Carranger fangirl who shows up and actually saves the day. Not only does she have the ability to transform but she also has her own mecha, Radiacar Robo, which was a transformation of her personal vehicle, the Radiacar. The funny thing is, beside the fact that she was portrayed by a different actress after her first appearance, she got progressively stronger during each of her appearances. 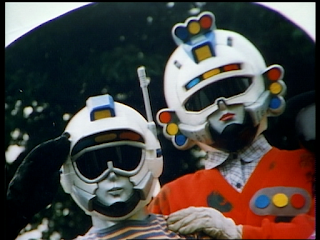 First she saved the day on her own, then she had her human-sized Radiacar Robo, and finally Radiacar Robo was able to grow to full-size mecha (complete with Ultraman style transformation). Her developing power was a neat way to make the character more interesting. As with all things, however, things aren't as random as they seem. Radietta is actually the younger sister of Zonette. It was kind of a coincidence at first, but after discovering a matching crystal during her first appearance, she realized that her missing sister was near. At first she failed to convince Zonette to return home to their family, she was later more successful once their home was in danger. A band of outlaws that operate out of the Baribarian...cluster? It's not really a planet, is it? It's a jumbled mess of roads that contains the BB Saloon, which is where the Bowzock spend most of their time. They're basically as naive and hapless as the Carrangers, but they are pretty deadly as they did previously destroy Dapp's home planet, Hazard. They are lead by Gynamo who basically acts on Zonette's wishes. 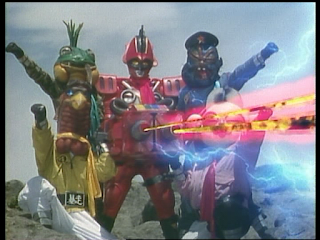 I would liken their trajectory to the Yokai in Kakuranger. At first they were seemingly harmless despite their intentions to level the Erf. As the story progresses, however, you begin to learn that there is perhaps more to them. While captured, Dapp makes the discovery that his home planet wasn't a random target of Bowzock afterall. It turns out that Exhaus coerced Bowzock via greeting card by stating that they would get good luck by destroying a planet beginning with "Ha". This kinda opens up the Bowzock for their redemption. The leader of Bowzock. 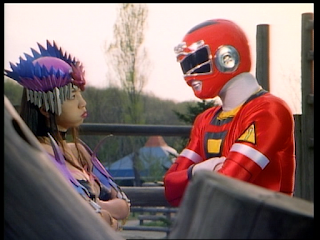 He is pretty much driven by whatever Zonette wants, but he grows to get annoyed at Carranger constantly getting in his way. He is basically as inept as everyone else in the series and is woefully dim despite his power. He is briefly kicked out of Bowzock along with Zonette leading them to get jobs to get by. After regaining leadership, he is once again kinda overtaken--this time by Exhaus. While he was pretty strong, he was shown to be like any other gang leader and lead through intimidation. He was a big, scary looking guy after all. Zonette really had no interest in him, but since he was charge she lead him along to her advantage. Gynamo's loyal(ish) second in command. He has had a long history with Gynamo and is basically the only one who can be trusted in the organization. That is...until you put a suitcase of money in front of him. He is the most capable of the Bowzock leaders given his normal size and shape, so I guess this makes him the muscle of the gang. He wasn't without his faults, though. Like Minoru, he had a fear of lightening. 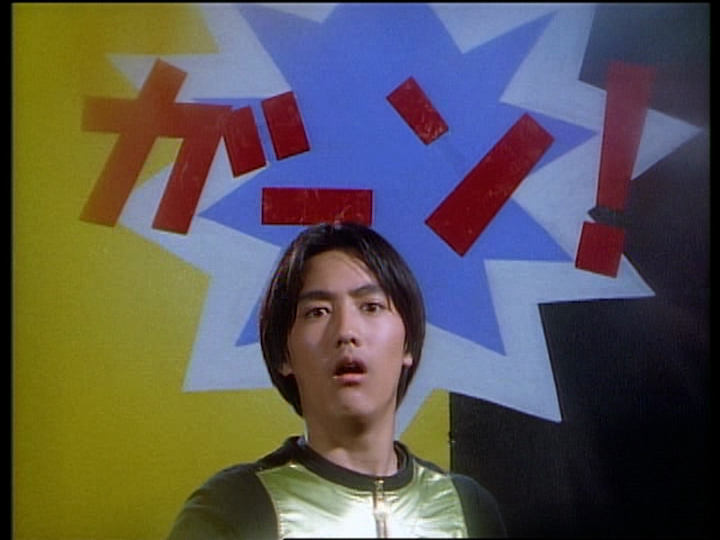 While Minoru was cured by eating an electric eel, Zelmoda faced his fear head on to overcome it. I like his literal space pirate look. An alien...dressed like a pirate. Not to mention, he had that awesome sword made up of a deck of cards. 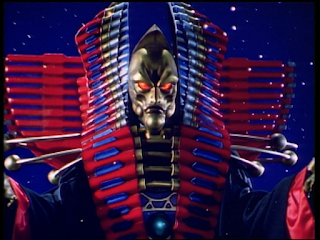 It's kind of a shame that they durped up his face in the Power Rangers version. Heh. 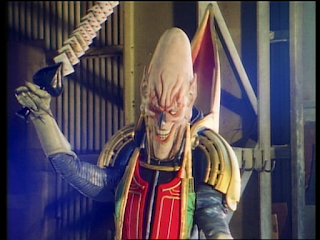 Grotch occasionally had an invention that he would make for a Gorotsuki, but otherwise he hung around BB Saloon like everyone else. He was complicit in turning on Gynamo and Zonette when bribed. I imagine he would have done it for far less than what it took for Zelmolda. It's kinda hard to say she is truly part of Bowzock as she is more of a bored brat who is along for the ride. It is pretty funny to have a character come along who completely acts on their own agenda. 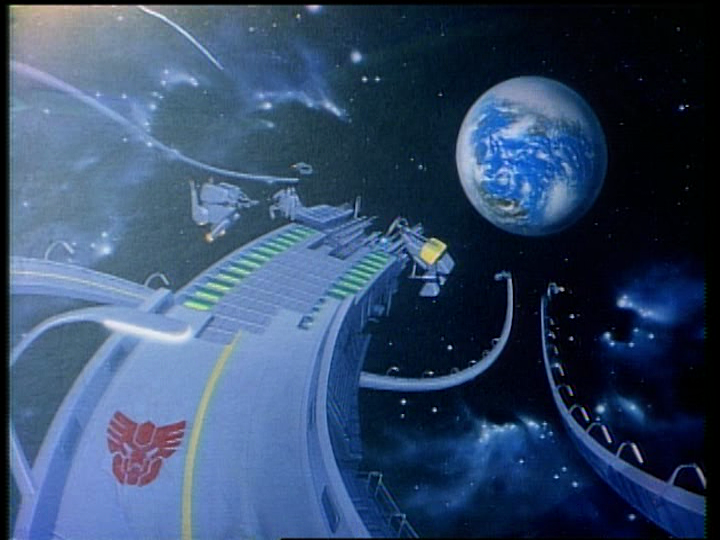 At the beginning of the series she wants to turn the Erf into fireworks and Gynamo begins his mission to do just that. She got the ball rolling, but really had no true malicious motivations beyond just wanting a fireworks show. Things kinda change, though. Zonette develops a major crush on Red Racer. 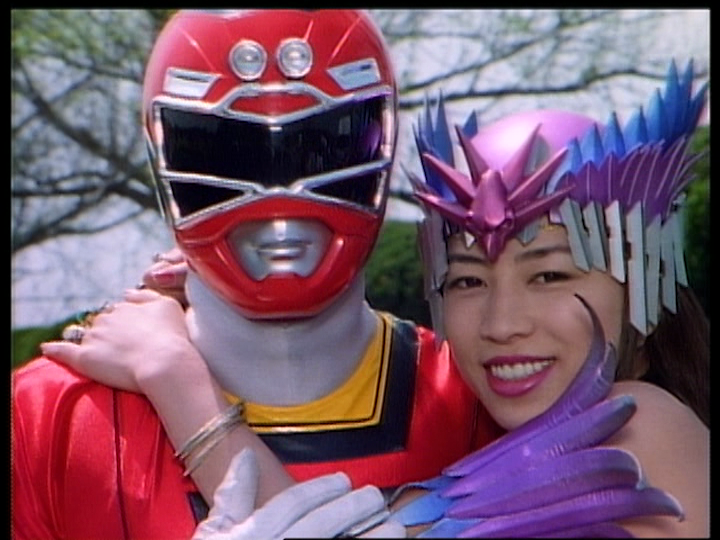 After sharing her feelings with Red Racer and getting snubbed, her desire for Erf fireworks was renewed. Kyosuke decides to try to smooth things over with her and himself snubbed. Eventually Zonette does begin to warm to Red Racer once again and even helps them out via her diary. Kyosuke really does end up having feelings for her, but kinda keeps in mind that she isn't interested in him...only Red Racer. Things kinda heat up when Kyosuke finally reveals his identity to her. He once again goes overboard in proving himself, this time to show that really does care for her and will protect her no matter what. This results in Zonette leaving Bowzock and resuming her previous life as Vanity Mirror, returning to her home planet with Radietta. She constantly refuses suitors as she is revealed to have finally fallen for Kyosuke. 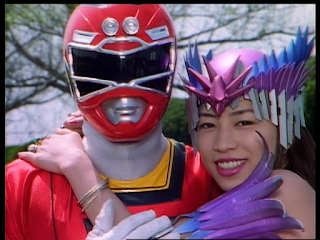 I almost want to say that the Red Racer/Kyosuke/Zonette relationship was a response to the ongoing soap opera known as Jetman. At the very minimum it lead to the funniest sight gags of the series. Sadly almost devoid of any personality. 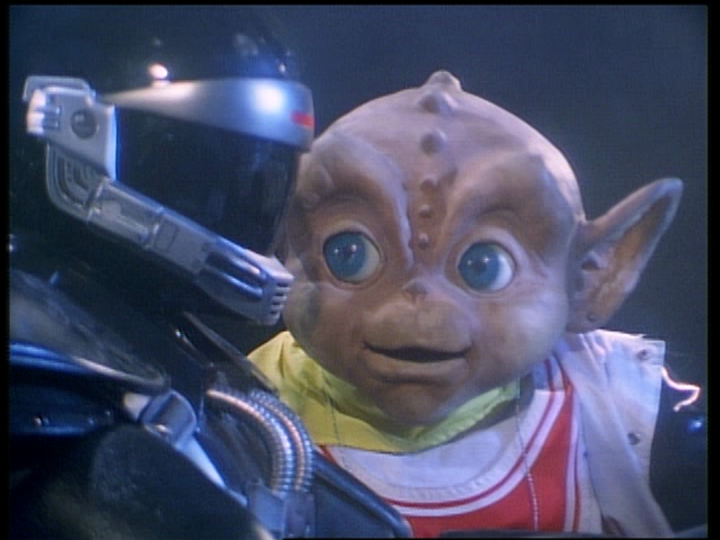 Something I really liked about the Noboru Sugimura shows were how memorable the grunts were (I think the Golem Hei in Zyuranger have to be my favorites...between ringing the doorbell, jumping out of a cake box, and disguising as a baby). They tried to give the white one a little gimmick, but I think they only visited that maybe three or four times before pretty much abandoning it. The only thing they accomplish is making me hungry for takoyaki. He was hired as a consultant to help coach the Bowzock on strategies to get rid of Carranger. He is shown to be somewhat of a scam artist at first, but does begin to actually have some success after gaining more power and becoming Ritchiritchihiker. He casts Gynamo and Zonette out of Bowzock and is able to steal RV Robo using his personal mecha, Braking. He eventually meets his end after VRV Robo destroys both him and Braking. Gynamo and Zonette then return to Bowzock once Ritchihiker is out of the picture for good. A one-off thing. 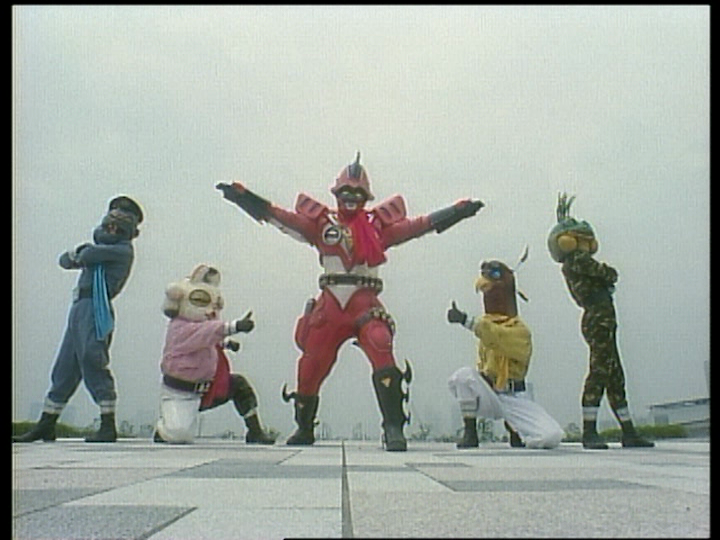 The Zokurangers were made up of four of the random Gorotsuki that inhabit the BB Saloon and SS Pamaan as Zokured. This episode was complete mayhem. 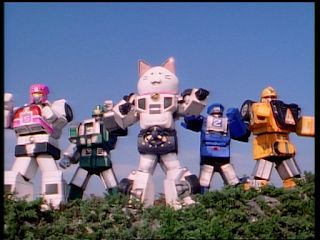 Not only did we get White Racer, but we had the Zokurangers with their bespoke theme song and poses/attacks from previous Sentai. Only SS Pamaan met his end. The other four returned to the BB Saloon to resume their lives of set dressing. 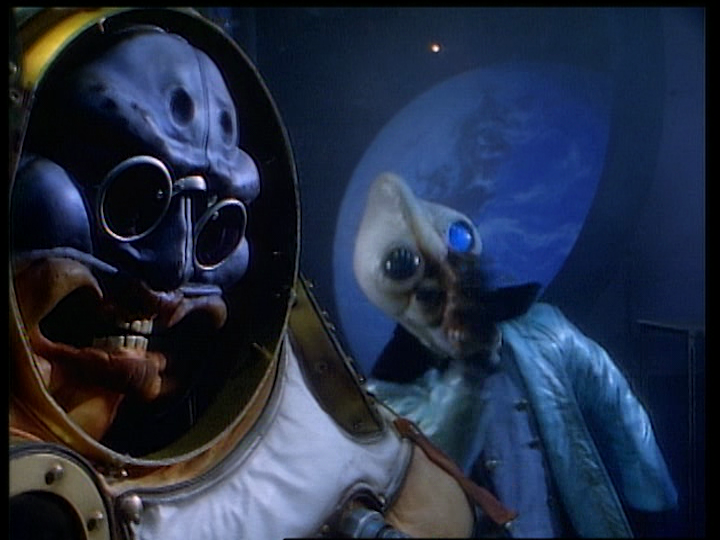 The ultimate bad guy of the series and one that had been stringing Bowzock along longer than they could have realized. It was his suggestive note that lead to Hazard being wiped out. He now wants Erf destroyed so that he can continue building his toll highway through the galaxy. I would say that he is a master of manipulation, but he really only seems to fool dimwitted characters like Bowzock and Signalman. 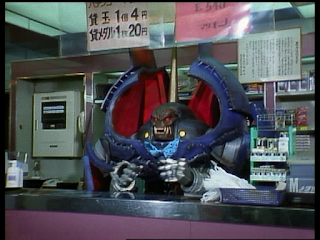 He is shown to be this oversized presence in space whenever he appears, but is only a giant when he appears on Erf in the finale (before being shrunken down to human-size thanks to some expired imoyokan). 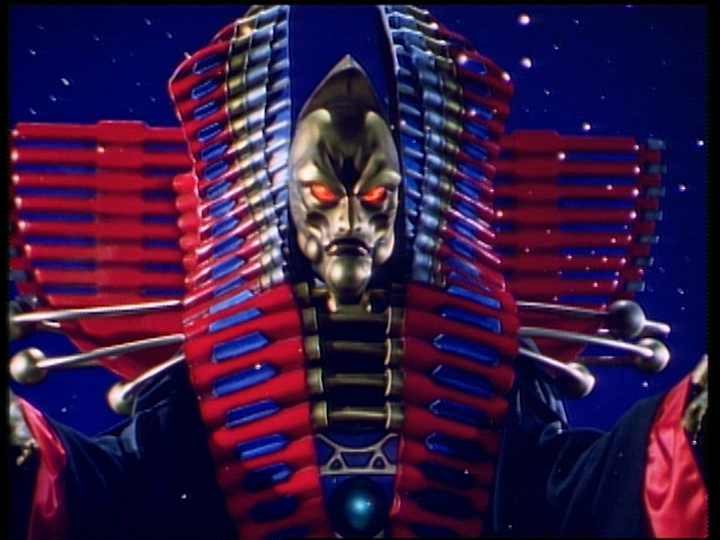 I thought his enormous presence was really cool since the design complemented it. Contrary to everything Carranger was up against prior to his arrival, Exhaus was truly powerful and virtually unstoppable. It really is a miracle that they were able to beat him in the end given how calculated his plans were. 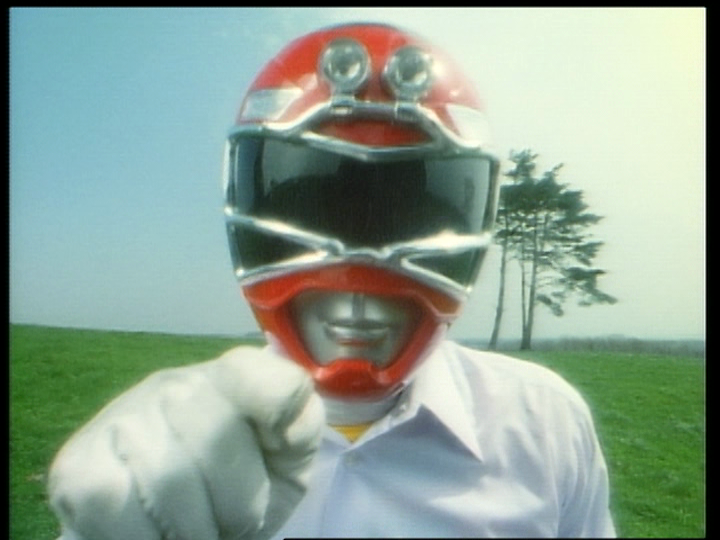 Thank you for reading Part 2 of my series of Carranger posts. The third and final post will be probably what a lot of people have been waiting for...the Top 7 Lists. Naturally I will be going over my favorite episodes...but I'll also be ranking some other aspects of the series. Be sure to look both ways before crossing the street!